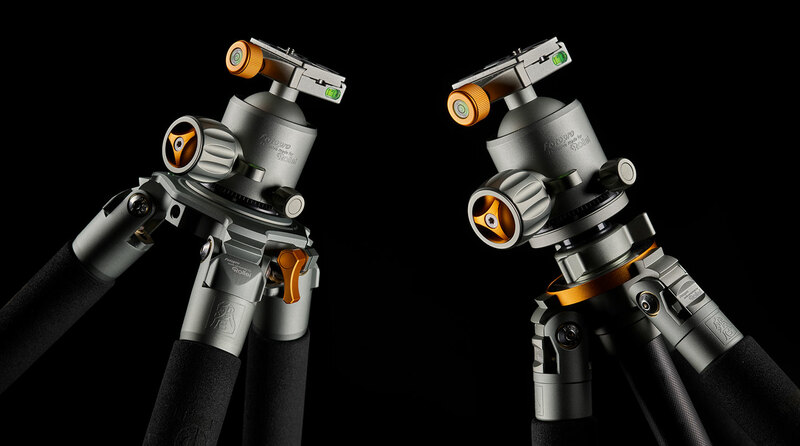 There’s a new kid on the block – well, triplets, actually : The Rollei Lion Rock Mark II series of tripods, with three different heights and capacities of up to 20kg, 25kg and 30kg. 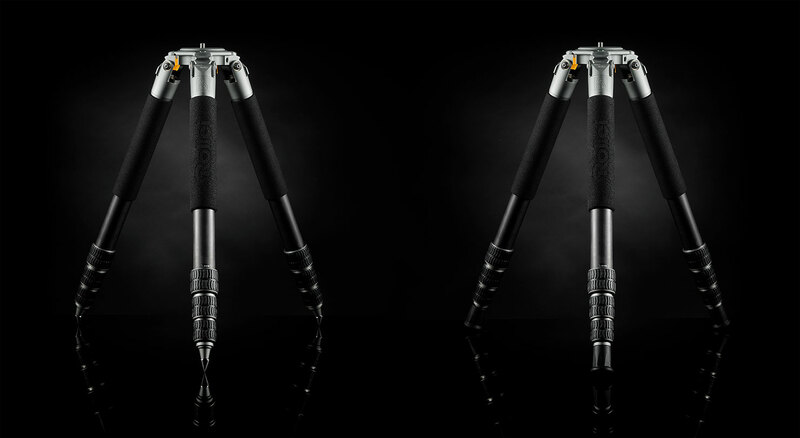 So, having used tripods from Manfrotto, Really Right Stuff, Gitzo and many others – after years of them trying to convince me to switch from my existing “old favourites”, could this finally be “the one”? Last year, I was lucky enough to be given a pre-release version of Rollei’s latest collaboration with FotoPro – from their new premium range – the “Lion Rock 25“. Despite a great performance, there were a few little “niggles” and improvements that were yet to be made, and for me, it wasn’t quite there at the time. 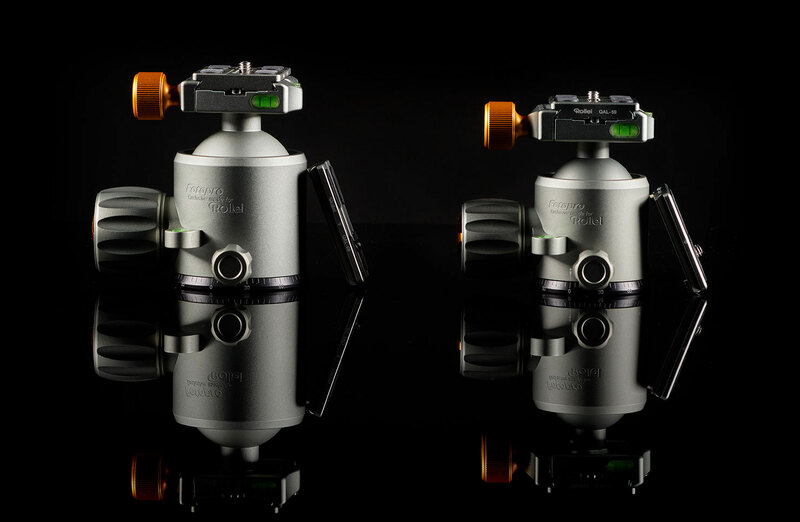 Coupled with the stability of the 20, 25 and 30kg payload leg systems, the two beautifully machined aluminium ball-head options come with up to 20kg and 25kg of supported weight in their own right. Each is delivered with two specially-engineered low-profile Arca-Swiss style base plates, and the movement on these heads is smooth, positive and solid throughout. Quick to set up, the special “1/4 turn” leg locking system is strong and sturdy, with one of the smoothest extension actions I’ve used to date. So, what about the unique changes to the Rollei Lion Rock Mark II system? Well, to my knowledge, there are three key features you won’t currently find in combination on any other tripod in the market. An enhanced Carbon-Fibre Leg Construction. 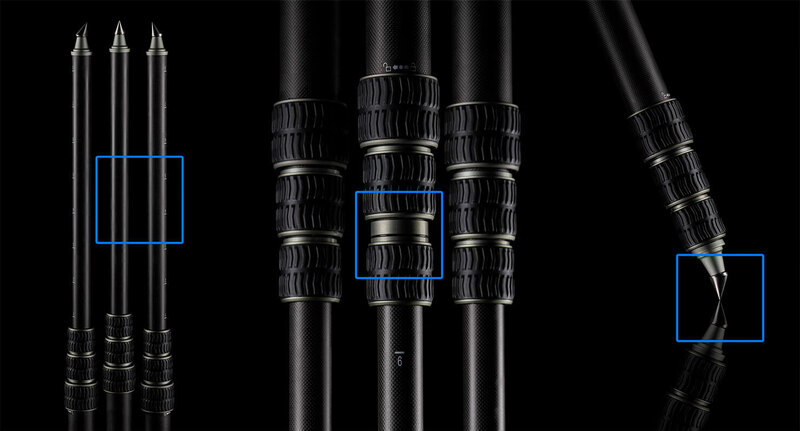 Gone are the claims of “6 layers”, “7 layers”, even “8 layers” – these legs are formed from 11 separate layers of Mitsubishi carbon fibre, specially built for Rollei – making the 4 leg sections among the strongest around. Built-in gaskets into each twist-lock leg mechanism, preventing water, dirt, dust and debris from ever entering the slider. Unique “90 degree” spikes in the legs, falling perpendicular to the ground below, meaning the entire weight of the tripod and kit is pushed straight down. That’s in contrast to most other systems where the spikes follow the angle of the leg itself, spreading the weight outwards from the centre (which, sadly, encourages slippage on certain surfaces). With all of those improvements, Rollei really are pushing this series as their premium range of tripods – and these remain features which are unique to the Lion Rock range at this point. The sturdiness is further improved on the Lion Rock 30 – where the removal of the centre column means even less chance of movement (through vibration, wind, or otherwise) when shooting. But it’s the 90º spikes which are the headline here – and rightly so. The tripods all come with rubber feet “covers” for the spikes, and can operate just as any rubber-footed tripod on the market with these attached, but it’s the rock solid stability that comes into its own when you take them off. Before I go any further, I do need to address one issue : Spikes do not necessarily help reduce camera shake in every situation. There, I said it – despite what many other photographers claim. The problem is that it depends what type of vibration/shake you’re trying to avoid. If the vibration is coming from the tripod itself (often through wind catching on the camera or head/legs), then switching to spikes will deliver sharper, more stable, reliable results each and every time as the direct connection to the ground does a better job of “anchoring” the legs without the risk of any movement. However, if the vibration is coming from the surface the tripod is mounted to/on, then the rubber feet can actually help by providing a “dampening” effect, reducing such vibrations, to prevent them reaching your camera and affecting the final image. Plus, in locations where a large surface area is more important than “digging in” (think of sand on a beach, for example) – you may have to experiment to find out best configuration prior to taking that all-important exposure. The golden rule, as always, is assess the situation – but apart from when I’m on a building with vibrations on a guard rail or floor space, it’s fair to say that I’ll shoot with spikes more often than with the rubber feet attached. So, how to test the tripod which claims to be the ultimate companion for extreme conditions? Simple; take it on one of the worst airlines in the world (long story – for another time!) 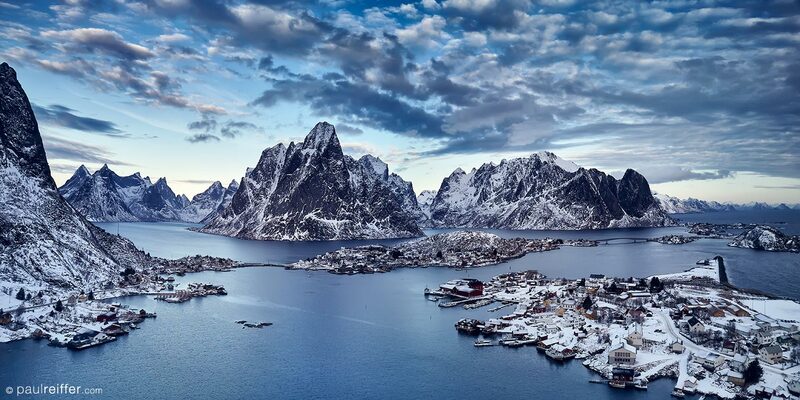 to Lofoten in Winter, one of the coldest locations to shoot. This is a place where I’m not walking on sand, above, I’m walking on frozen sand – it’s solid, your feet leave no trail; a place where the sea enters lagoons and instantly freezes; a place where 5 layers are often not quite enough. And dig, they did. Through reading the “near perfect” test result that came back from the labs, I was looking for great things here, but it really did perform better than I’d expected. Absolutely no slippage, the tripod provided the perfect stable base for each and every shot, with winds battering the camera (and filter system) at times to really see what it could do. With the built-in “vibration delay” feature of my Phase One XF camera system, I’m often waiting a few seconds from the button press (if not in a cable release) before the shutter springs into action – but not here. Almost instantly, the camera was ready to capture, suggesting a distinct lack of the normal vibration that I’ve become used to in such situations. Obviously, this was the perfect tripod, right? Well, no – not quite. There was still one small “niggle” that remained to make me switch to the Lion Rock 30 – it just wasn’t quite tall enough without that centre column. The decision to remove the column was a great move – in general, while they add height, they also introduce shake. However, when I’m shooting from a rooftop or city skyline, every now and then I really do need that extra bit of height (and would sacrifice, somehow, a bit of the the stability for it. Something I told the team in preparation for my upcoming cityscape shoots. Enter : A FedEx delivery on my return. And with one signature, there we have it – a convertible tripod! Rock solid and stable with no column when I need to shoot landscapes in the wind, along with the option of an extra 40cm of height when I really need it. A quick release mechanism makes the switch easy, and while it’s an “extra bit of kit” to bring with me, the option of having the best of both worlds was the selling point from my perspective. It takes the same ball-head, obviously retains all the other features of the tripod itself, and with its carbon construction adds almost no extra weight over the standard central plate. The results? A shot of Boston which would have been impossible without the add-on column. So, is this the “best” tripod in the world? Well, as always, it depends on your definition. Is it the most expensive? No, but it’s also not the cheapest! Does it have every single feature that every other manufacturer has ever thought of? Probably not, but what tripod does? Is it loaded with the right set of features and functions to mean I can confidently get the best images from any of the locations I intend to shoot? While I’d still like a variable-angle column (or even a 90º one for that matter and have already put in the request!) – in all other respects, absolutely, yes it does. And, to my opening question, is it the most stable tripod I’ve ever fixed my camera to in order to shoot? Without a shadow of a doubt – this is the most stable tripod I’ve ever used, beating all the systems I’ve tried so far from Really Right Stuff, Gitzo, Manfrotto, and many others. Well done Rollei, it took some time – but you’ve convinced me. This one’s staying in my kit bag!